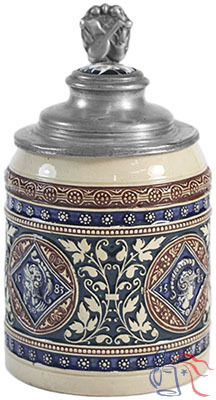 Pottery or stoneware, relief, 0.5L, pewter lid (shown with porcelain inlay). The portraits on this stein, dated 1583, most likely represent Achilles and Agamemnon, popular subjects in Renaissance art, and two of the principal protagonists in the Iliad, Homer’s epic poem set during the ten-year Trojan War. See also Nos. 231, 410 and 1150.